RV parking is very nice. We got lost finding it and ended up in the truck parking area. 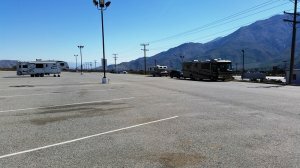 We were were then escorted by security to the RV parking. There is a gas station on site. Our overall impression was tempered by the stingy slots and expensive top floor restaurant. We had a glass of house wine while we read the menu and the wine was about $12 a glass!